In 1965, there were only two countries that had rockets capable of launching orbiting telecommunications satellites: the United States of America (USA) and the Union of Soviet Socialist Republics (USSR). Three other countries, the United Kingdom (UK), Canada, and France, had placed satellites in orbit atop U.S. rockets by then. A total of 45 had been launched by 1965 according to a list on Wikipedia; however, many - if not most - had re-entered the atmosphere by then due to their low initial orbits and three of them targeted the sun, Venus, and Mars. Others might still have been orbiting, but their power supplies had expired. 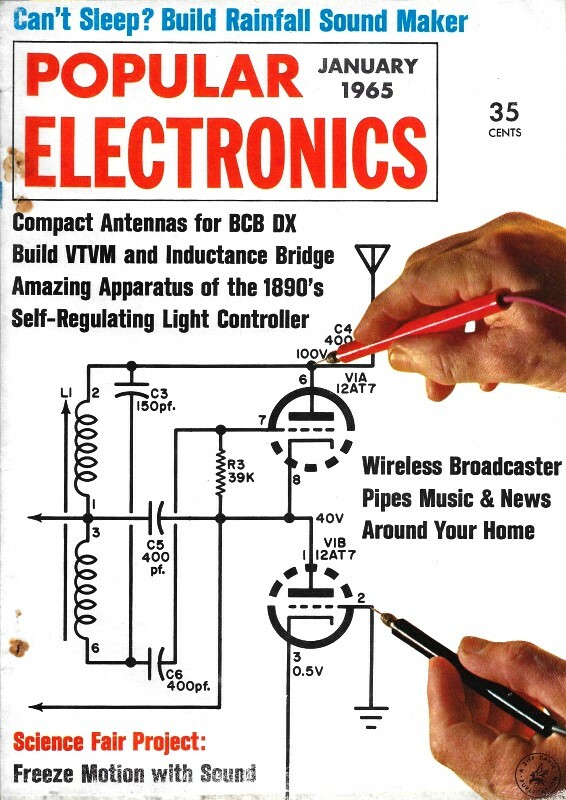 Many of the electronics magazines at the time published a monthly list of active satellites that were available for tracking and monitoring of signals - a nerd sport of the era. OSCAR 1 (Orbiting Satellites Carrying Amateur Radio ), the first amateur radio satellite launched in 1961, had long fallen back to Earth by 1965 and therefore was not in this Popular Electronics list. The following satellites were in orbit and transmitting as this issue closed. The satellites are listed by frequency and by code name. Some satellites are mentioned several times since different frequencies are used for tracking and telemetry. Vanguard 1 * .... 108.012 mc. Echo 2 ............... 136.020 mc. Telstar 2 ............ 136.050 mc. Explorer 18 ........ 136.111 mc. Relay 1 ** ......... 136.140 mc. Relay 2 .............. 136.142 mc. Explorer 21 ........ 136.145 mc. Echo 2 ................ 136.170 mc. OGO 1 ................ 136.170 mc. Explorer 22 ........ 136.200 mc. Tiros 8 ................ 136.233 mc. Tiros 7 ................ 136.234 mc. Explorer 20** .... 136.350 mc. Ariel 1 ................ 136.406 mc. Syncom 2** ....... 136.468 mc. Syncom 3** ....... 136.470 mc. Ariel 2 ................ 136.558 mc. Relay 2** .......... 136.620 mc. Relay 1 .............. 136.623 mc. 1963 38C (USA) . 136.651 mc. Explorer 20** .... 136.680 mc. 1964 40C (USA) . 136.771 mc. Solar Radiation .. 136.886 mc. Tiros 7 ............... 136.921 mc. Tiros 8 ............... 136.924 mc. Syncom 2** ....... 136.980 mc. This listing does not include all of the satellites in orbit - many of which no longer are transmitting, or transmit erratic, very weak signals. Satellites of the Soviet Union generally use tracking and telemetry frequencies in the band between 19.990 and 20.010 mc. Exact frequencies of the Soviet satellites are broadcast by Radio Moscow immediately after launching. In orbit, but apparently not transmitting, are Cosmos 25, 31, 36, 38, 39, 40, 41, 42, 43, 44, and 48. Weak signals have been heard from Elektron 2 on 19.430 and 19.540 mc., according to some observers.